- Date: 09/2012, Seed: undisclosed amount (post valuation: undisclosed amount). Great team - differential product with demonstrated ROI - focused on customer success. I've used Yozio in a number of ways to improve our business. Here are 3 that may be useful for you. Lei and company are constantly iterating on their product, so what you see today (which is very good) won't even come close to matching what they'll have tomorrow. They've also been very attentive to our complaints/questions. 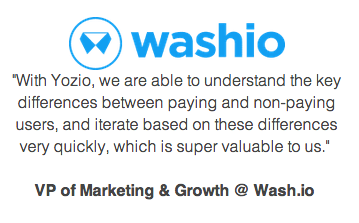 Feel free to reach out to me with questions about the service and how we use it at Washio. Lei and team are building a great product and company to help mobile client grow their user base through better/smarter marketing execution. Don’t re-invent the wheel - leverage Yozio to maximize your growth. Yozio has a really great team that can execute. They have been really pushing the envelope of user insights automation. Yozio product is seriously result oriented. It is a must-have for any mobile app builder who wants to grow customer base in the most efficient way. 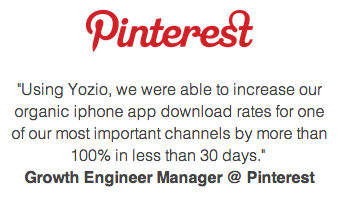 We help mobile apps grow their active user base 10 times faster than their competition. Understand what your best users looks like. Find the best channel, messaging and context to acquire them. Activate them before they churn away. 1) Who's the problem with current solutions? Acquiring mobile app user is very hard and expensive, turning the hard earned app installs into loyal users is even more harder. We are productizing even better technologies than what Twitter & Netflix have developed internally to grow their user base, and making it available to all of the mobile app creators. 2) Who's your target customer? SMBs? Mobile apps? Any particular vertical? Anyone who has a mobile app, and trying to get more loyal users. 3) Are you an analytics company? Sort of, but much more than that. We work with apps and their current analytics vendors to provide much deeper user insights, and essential technologies to improve their chance of turning ordinary users into high value users. 4) How do you help your customers acquire more mobile users? Can you provide a case study? We use the same scientific methods that Twitter/LinkedIn/Netflix are using to optimize their products. 2) Find the best channel, messaging & context to get them. 3) Activate them before they churn away. However, it's a very slow process and super expansive to do for most companies, so we made it much more automated, and much easier to use, and accessible to most of the companies who are trying to get more high value users for their mobile app. Airbnb has mentioned us on their dev blog about how they hacked their word of mouth on mobile. 5) How much do your customers pay? We have a tiered monthly subscription model that depends on which module and how much our customers uses our product. Ranging from $1,500 a month to $5,000 a month. 6) What kind of "actionable" data do you deliver? What your best (the most engaging users, high retaining, or high LTV users, etc) users / user profile look like? + Using twitter as an example, their best users (meaning come back to use their service after 30 days) follow 30+ friends, and have 1/3 of their friends follow them back. How are they different from the ordinary users? 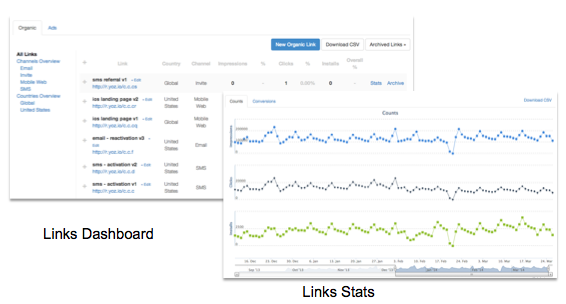 Which channels, messaging, context are the best to find my best users? + twitter? facebook? email? sms? viral? content? when? where? what kind of condition? what message made them convert? Disclaimer: These are just examples. The numbers mentioned are not real reflections of the actual companies or customers data. Yahoo Frontpage, Netflix Marketing, Yozio Mobile Growth. I specialize in Mobile, Data, Metrics, Growth, User Acquisition, 1st Time User Experience, Engagement/Viral Loops, A/B Testing, Personalization, Recommendation, Machine Learning. Experienced tech executive focusing on Internet and Mobile innovations at early stage and expansion stage businesses. Our core team and advisory team have a lot of Growth experience from Yahoo, Netflix, LinkedIn, etc. We specialize in engineered marketing, user life cycle management & generating user insights from petabytes scale datasets. Combining these cutting edge concepts, we are able to create much more efficient software systems to better acquire and retain users for mobile apps. We've been one of the earliest to explore this subject on Mobile, and have accumulated a lot of knowledge/insights about how to grow on mobile. We already have many paying customers, including Airbnb, Pinterest, and many other successful apps, and they have been very happy with the results. The founding team has a lot of startup experience. Prior to Yozio, Lei (CEO) has been starting companies since he was 18, and Li (CTO) has started 4 companies and had 1 successful exit since his early 20's. Our exceptionally passionate & supportive investor & advisory team is consisted of the many experienced technology and business veterans from Yahoo, eBay, LinkedIn, Microsoft, etc. Yozio was featured in a VatorNews article: "Funding roundup - week ending 1/9/15"
Yozio was featured in a VatorNews article: "The five finalists for OakTown Tech Startup Competition"
Eric Ries confirmed Yozio as an investment. Morado Ventures confirmed Yozio as an investment.